Rearrange My Furniture: Vintage Vantage Swears By... 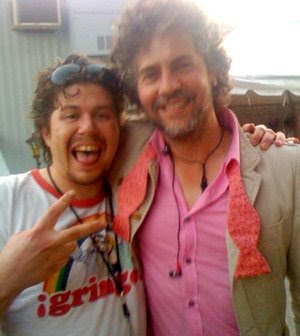 The Flaming Lips! Vintage Vantage Swears By... The Flaming Lips! Santa clauses, aliens, giant plastic bubbles, confetti guns, balloons - there is no spectacle quite as spectacular as a Flaming Lips show. And their music ain't bad either... Check out our buddy Frosty (in our gringos shirt) w/ Wayne to the right. Then check out some tunes on their myspace. If the scale of my agreement to everything in this post was symbolized by strawberries, everyone in America would be drinking an extra large smoothie right now. Go Lips! We just saw them a little while ago in Ireland and it was fantastic. Why Don't They Bring Back... Baby Wee Wee! Draw Us a Picture of a Peanut! Top Shelf Essay Contest Winner! Is This Shirt Too Much? Blank Ringers for Two Dollars and 50 Cents Each! The Love Bandits at Burning Man!